It was drizzly when we were on our way to Logan airport the evening of October 4th and I cannot say the mood in our car was relaxed. I hate to fly and it shows. My husband had gotten out of work early, but we still did not leave home on time. I was worried between his late packing and my 15 month old sons hyper activity we would certainly miss our 8:10 flight to Orlando. Luckily, there was little traffic on our way into town and we managed to find a parking spot and get through security with an hour to spare. 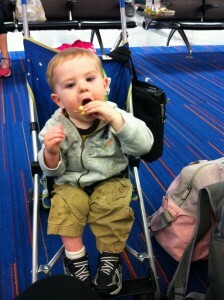 My son, Weston, did not want to sit still in the terminal. He was screaming, wiggling, and only happy when on the move. I knew it, we were going to be the family on the news complaining about being kicked off the flight for having an unruly child. When we boarded our plane we gave the little man a bottle and he was out before we hit 30,000 feet…score! Our flight was delayed so we did not land in Florida until after midnight. We were all exhausted, but we had the good fortune of being on a magical express bus with a dance troop of pre-teens who kept us wide eyed the entire 40 minute bus ride to the world. 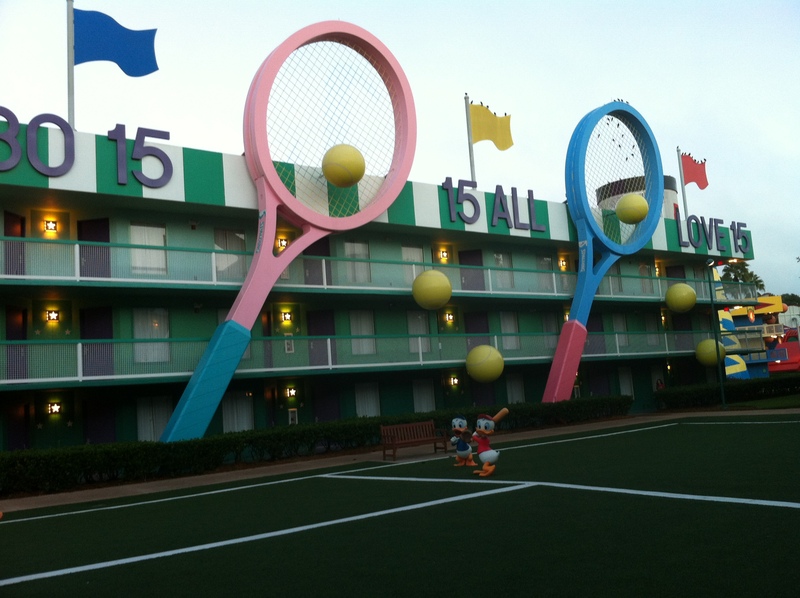 Our destination was Disney’s All Star Sports where we would spend one night before transferring to The Beach Club. I got a great pass holder rate on All Star Sports and since we didn’t arrive until after 2am it was senseless to pay for an extra night at The Beach Club. The room at Sports was small, but clean and comfortable…that is except for the little tree frog who decided to join us! We were on the first floor and the little guy must have found a way in. We were tired and I decided I could deal with a little peeper, but did report it in the morning. 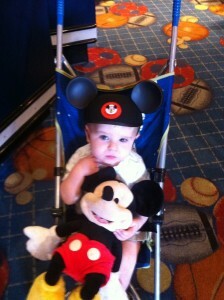 Friday morning after some Mickey waffles and a quick trip to the gift shop (To get Weston his first pair of ears!) we moved to The Beach Club. This resort is amazing. It is so clean, beautiful, and relaxing. 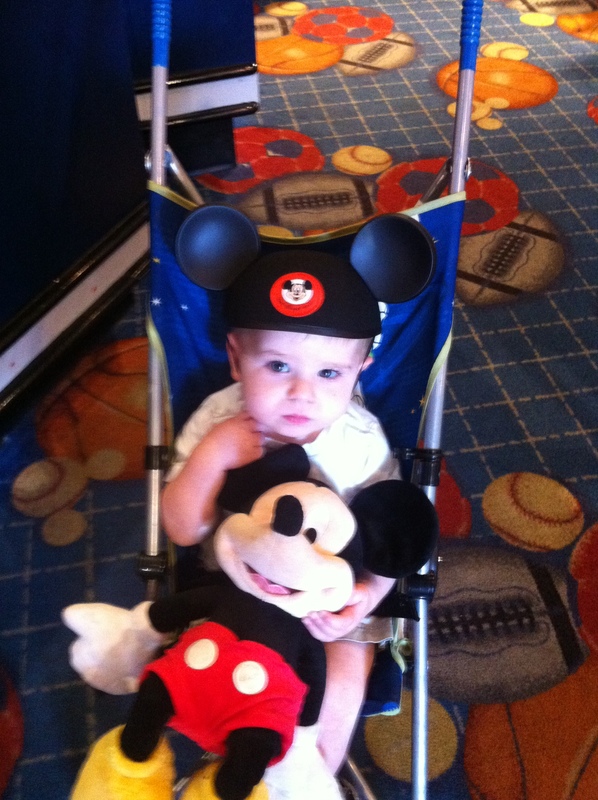 Our room was not ready yet so I picked up the stroller I had rented from Kingdom Strollers. The stroller had been delivered to the resort and was in superb condition. It had all the bells and whistles including a rain cover and cup holders! I was EXTREMELY impressed with the service and would highly recommend them to anyone. With the baby in the stroller, sunscreen applied, and water bottles packed we headed out into the heat to Epcot! It took us less than 6 minutes to walk to the back gates of the park. 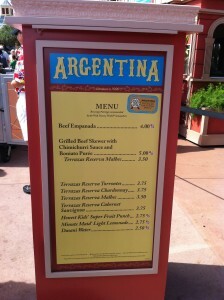 We arrived just as the World Showcase and Food and Wine Festival was opening. Perfect timing! 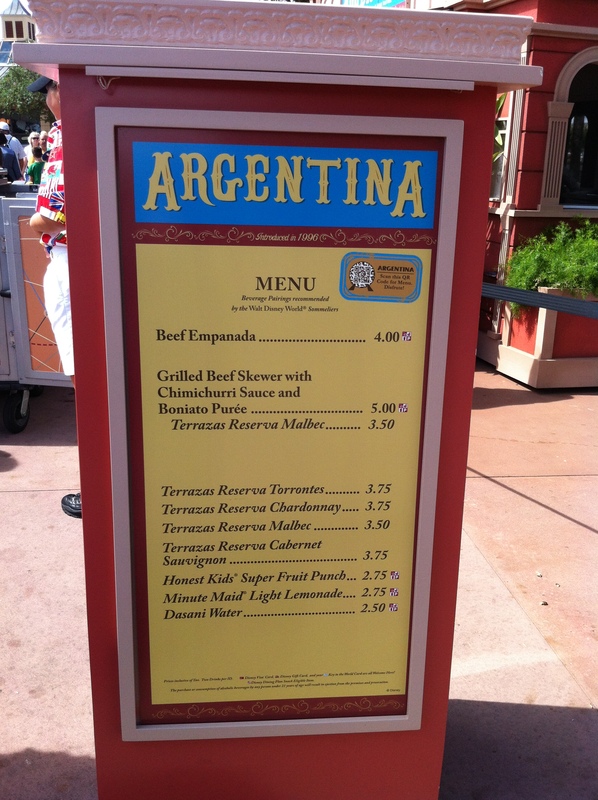 Food and Wine is a must do! There are dozens of countries represented by kiosks around the lagoon and you can indulge in samples of native dishes and drinks as you walk around. My absolute favorite booth was Hawaii where they had amazing pork sliders and mai tais! Yummy!!! I loved the food here!! One of my favorite rides! 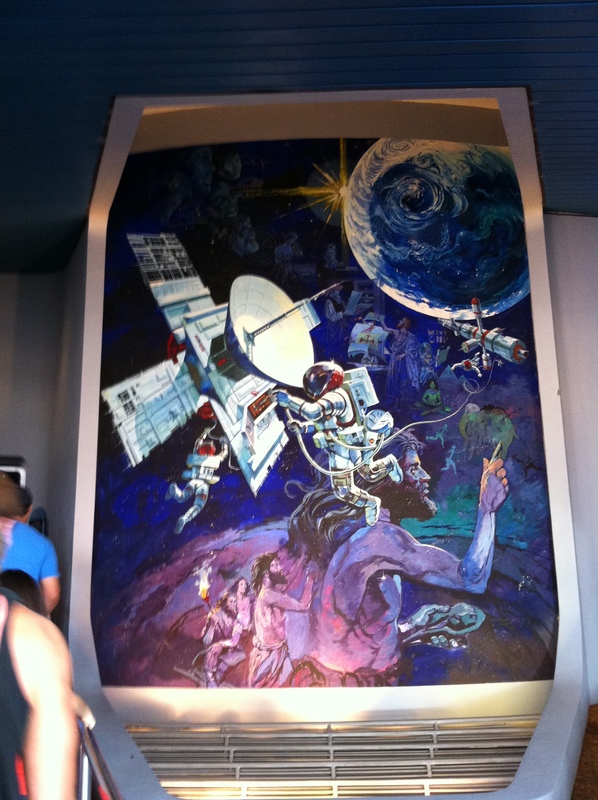 Spaceship Earth! We took our little guy on Spaceship earth, The Seas with Nemo and Friends, and Living with the Land. He loved them all! It was getting really hot though so we decided to hit the pool! The Beach Club is home to arguably the best pool on property, stormalong bay. The pool has a sand bottom, a lazy river, and a super cool water slide. We were so relieved to get out of the heat and into the water!!! We spent the rest of the night eating our way around the world at Epcot. I also did something new!!! We visited the Japan pavilion where you can (for the bargain price of $16.00) choose an oyster from a tank and get the pearl. The girls at the booth make a HUGE production out of it and its really fun. Once your pearl is removed from the oyster you can choose a setting for it. 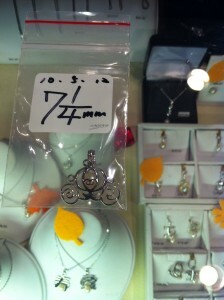 I chose a Cinderella coach pendant that will go on a necklace. The setting range from about $15 on up. My pendant was $50.00. It was a great experience though, and I came home with a unique and pretty souvenir! My Cinderella Pendant with the Pearl from my hand picked oyster! 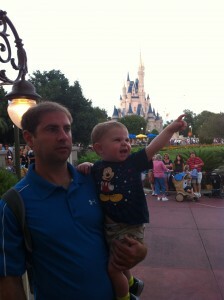 Saturday was time for the Magic Kingdom!! What a great experience with a child. He was so much fun to be with. He loved the pirates, scored more laughs on the jungle cruise than the skippers cheesy jokes, and clapped his way through the flying carpets. 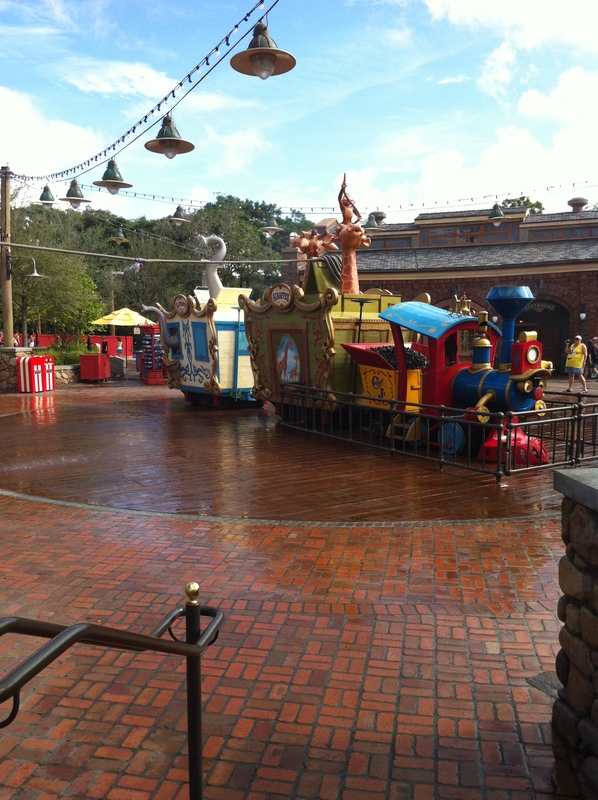 He did have two favorite attractions; The Teacups and Casey Jr Splash and Soak play area where he got drenched and loved every minute of it! This is a great area to take kids on a hot day so they can recharge their batteries! We had dinner at the Crystal Palace where Pooh, Tigger, Piglet, and Eeyore make the rounds to each table. It is a big restaurant and it takes close to an hour for all the characters to visit your table. Unfortunately, Weston has about a half an hour attention span and eating had already burnt through half that time. We only got visits from Piglet and Eeyore before we had to take the baby outside to avoid a meltdown!!! Oh well, maybe next year! After dinner it was time for another round on Pirates and then we had to scope out a place to see Wishes, the nightly fireworks. We decided to sit on a stone wall in Fantasyland. Basically we were in between the castle and where the fireworks are actually shot off. It is a great location as there is usually somewhere to sit and you get spectacular views. I do not recommend this place for first timers as you do not get the full effect of seeing the fireworks appear over the castle, but if you have seen the show prior this spot cannot be beat. Weston was great for the show. He tolerated the noise and even clapped along with the crowd. But as the show closed I was exhausted! We headed for the bus stop. My feet were killing me! The longest walk is the one to the bus stop at the end of the day. You are hot, sweaty, achy, and down right sleepy! My suggestion is to walk through the stores (they all connect so you do not need to go in and out!) I made a stop at the main street bakery for an eclair and a water and we slowly made it to the bus. Sunday was Hollywood Studios in the Morning! We walked to the park and arrived just as the turnstiles opened at 9am. It took ten minutes to get into the park and I ran to Toy Story Mania while my husband hit starring roles for some breakfast with Weston. It was 9:16 when I arrived at toy story and the stand by wait time was already 70 minutes. The line to get a fast pass took 10 minutes and my fast pass time was nearly 1 pm. 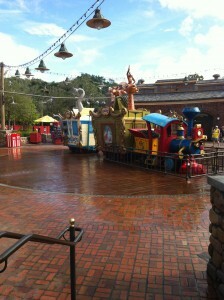 If you want to ride toy story you need to get a fast pass early in the day because they will disappear before noon! I met up with my family at starring roles and then we headed over to see Disney Jr. Live on Stage which was a huge hit with Weston! Then it was onto the great movie ride. The sun was brutal and we were all tired. 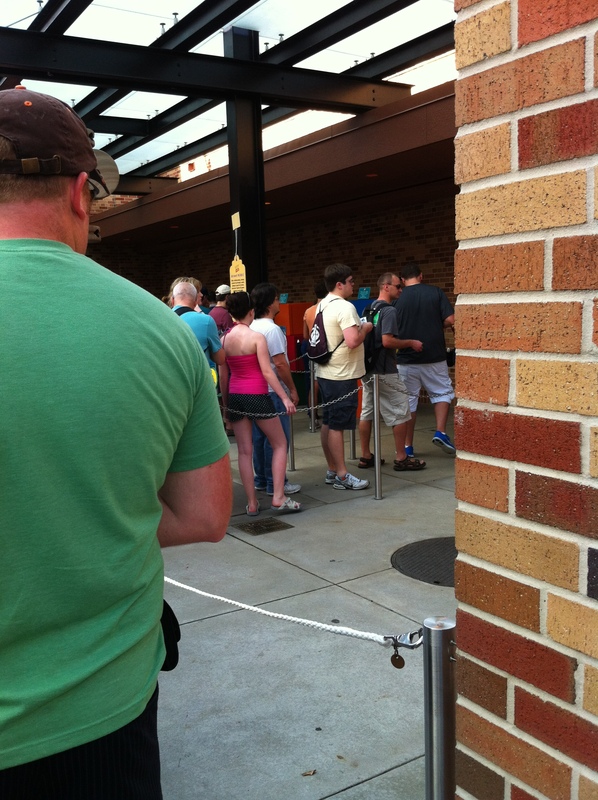 There was simply no way we were all going to last until our fast pass time. We decided to head back to the hotel for a nap. And nap we did…for three hours! The line to get Toy Story fastpasses! Sunday night the Magic Kingdom was open until 3am! I had hired a babysitter from a service called Kids Nite Out so that my husband and I could enjoy one kid free night. Our plans were to have a nice dinner and then hit the Magic Kingdom for some E ticket attractions!!! Our sitter arrived on time and I swear she was a modern day Mary Poppins complete with a British accent and a bag of tricks. She texted me several times throughout the night to report how our little guy was doing. I never once felt unsafe. We had dinner reservations at Yachtsmans Steakhouse, but opted to skip them and head right to the park. We knew we only had a few hours in us and a heavy dinner might mean skipping the park. We shared a romantic dinner at Pecos Bill Tall Tale Cafe and hit splash mountain and big thunder mountain several times. Space mountain was down when we went over, but I knew a secret! If you ride The People Mover when Space is down you will get to see the famous coaster with the lights on! It is really really cool!!! 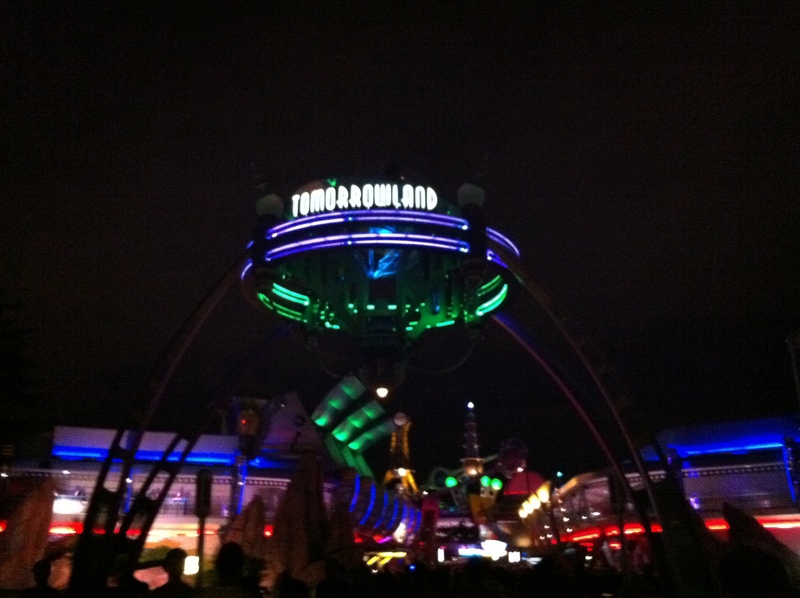 When the lights are on it looks no scarier than the barnstormer. We took some time to walk around the park, get some snacks, and talk. I love the Magic Kingdom at night. It smells wonderful, the lights are beautiful, and you can really feel the magic. 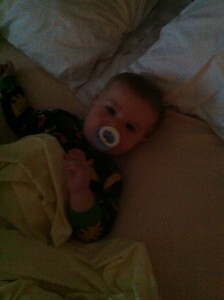 We got back to our room before midnight and found our little man safely tucked in with his Mickey plush. We paid the sitter and wished her goodnight. We fell asleep in seconds after she left! Monday we hit Animal Kingdom in the morning. I have to say there is not a ton for a little one to do there. Kilimanjaro Safari was great, but a bit long for Weston. He got a little board towards the end. 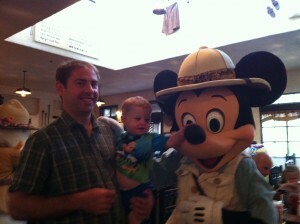 We had a 10am reservation for Donald’s Safari Breakfast at Tusker House and this was out of this world. The food was amazing and there were tons of choices from waffles and bacon to donuts and biscuits. 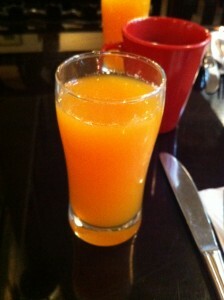 Everyone also get jungle juice included in the price of the meal. This is a mixture of guava and mango and it is awesome! 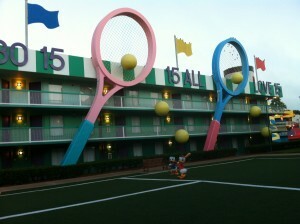 Donald’s breakfast boasts Mickey, Goofy, Daisy, and Donald as Characters! 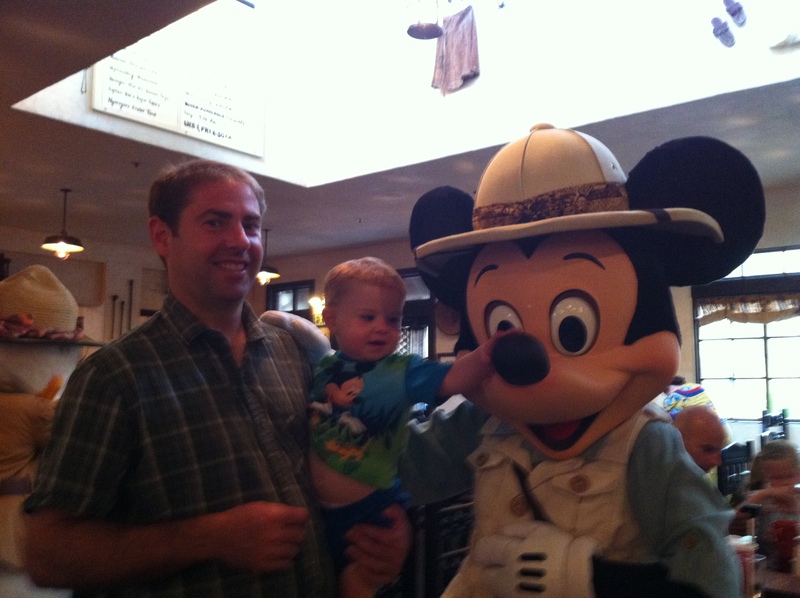 It was a magic moment when Weston met the mouse. He smiled and grabbed his nose! So cute!!!! We headed back to the beach club after breakfast to rest. Well, Weston and Russ rested, I did laundry. Oh well, it afforded me some pool time. The laundry at the Beach Club is located at the quiet pool which is nice because you can swim in between loads. 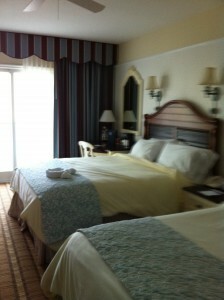 With clean clothes I headed back to the room. Tonight was Mickey’s Not So Scary Halloween Party! 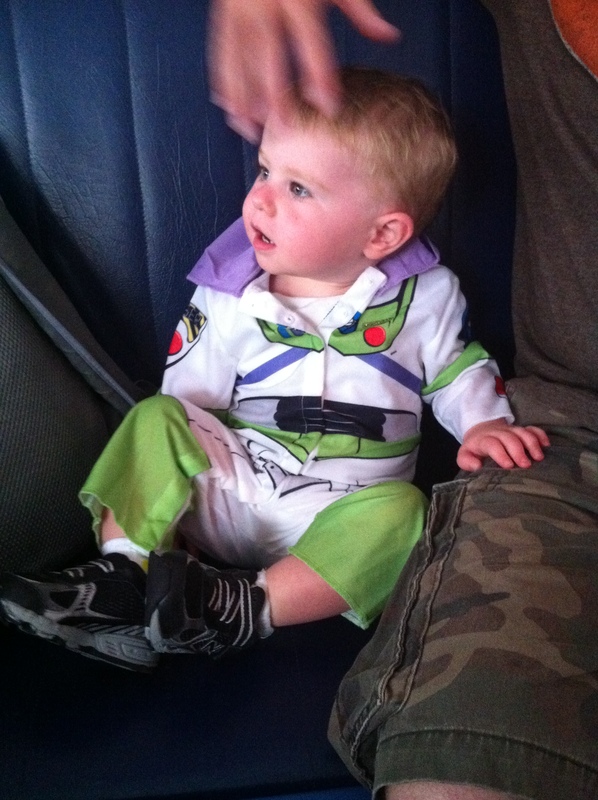 Weston dressed as Buzz Lightyear which was extremely cute!!! The party was great. We watched the Boo to You Parade complete with Headless Horseman, Grave diggers, and hitchhiking ghosts. We also so Hallowishes which is the absolute best fireworks put on by Disney. We collected TONS of candy from the various trick or treat stations throughout the park. Oh my goodness! The party was certainly worth the price of admission, but I am not sure we will do this every year. Maybe as Weston grows we will experience it again. I have done the party several times as a solo adult and love the short waits for rides. 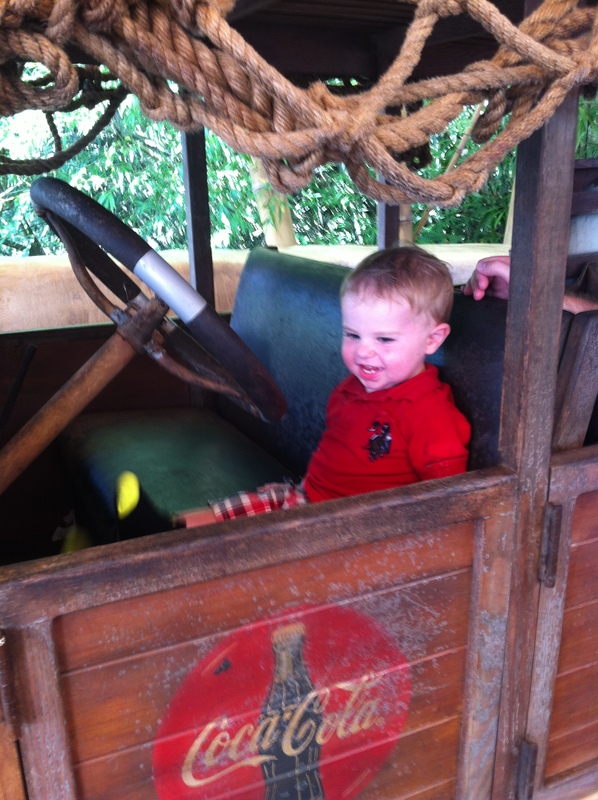 With Weston it is more about the experience as he can only ride certain attractions at this stage. Buzz Jr. on his way to the party! Tuesday it was time to pack up. We checked our luggage with the resort airline check in and stowed our carry ons with bell services before heading to Epcot on last time. We did a few rides, ate a few treats, and mostly just absorbed the atmosphere. We listened to the background music, watched the reverse waterfall, and ate Phineas and Ferb Rice Krispy Treats. The day was wonderful and it was the perfect ending to an amazing vacation! It was so awesome to share the place that I love most with the two people I love most! Disney as always, did not disappoint! Weston driving the coke truck on our last day! ← You are annoying…Stop it now!